This package is a dependency of the Hangfire’s bootstrapper package Hangfire, so if you installed it, you don’t need to install the Hangfire.SqlServer separately – it was already added to your project. Microsoft SQL Server 2008R2 (any edition, including LocalDB) and later, Microsoft SQL Azure. Snapshot isolation is not supported! Applies only to Hangfire < 1.5.9: Ensure your database doesn’t use the snapshot isolation level, and the READ_COMMITTED_SNAPSHOT option (another name is Is Read Committed Snapshot On) is disabled. Otherwise some of your background jobs will not be processed. The package provides extension methods for GlobalConfiguration class. Choose either a connection string to your SQL Server or a connection string name, if you have it. Starting from version 1.7.0 it is recommended to set the following options for new installations (for existing ones, please see Upgrading to Hangfire 1.7). These settings will be turned on by default in 2.0, but meanwhile we should preserve backward compatibility. Some of these tables are used for the core functionality, others fulfill the extensibility needs (making possible to write extensions without changing the underlying schema). Advanced objects like stored procedures, triggers and so on are not used to keep things as simple as possible and allow the library to be used with SQL Azure. SQL Server objects are installed automatically from the SqlServerStorage constructor by executing statements described in the Install.sql file (which is located under the tools folder in the NuGet package). Which contains the migration script, so new versions of Hangfire with schema changes can be installed seamlessly, without your intervention. You can isolate HangFire database access to just the HangFire schema. 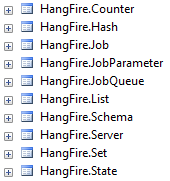 You need to create a separate HangFire user and grant the user access only to the HangFire schema. The HangFire user will only be able to alter the HangFire schema. Below is an example of using a contained database user for HangFire. The HangFire user has least privileges required but still allows it to upgrade the schema correctly in the future. One of the main disadvantage of raw SQL Server job storage implementation – it uses the polling technique to fetch new jobs. Starting from Hangfire 1.7.0 it’s possible to use TimeSpan.Zero as a polling interval, when SlidingInvisibilityTimeout option is set. This is the recommended value in that version, but you can decrease the polling interval if your background jobs can tolerate additional delay before the invocation.